Detective Brian Simonsen died after being shot in a “friendly fire” incident in Richmond Hill on Tuesday. Photo via the NYPD. 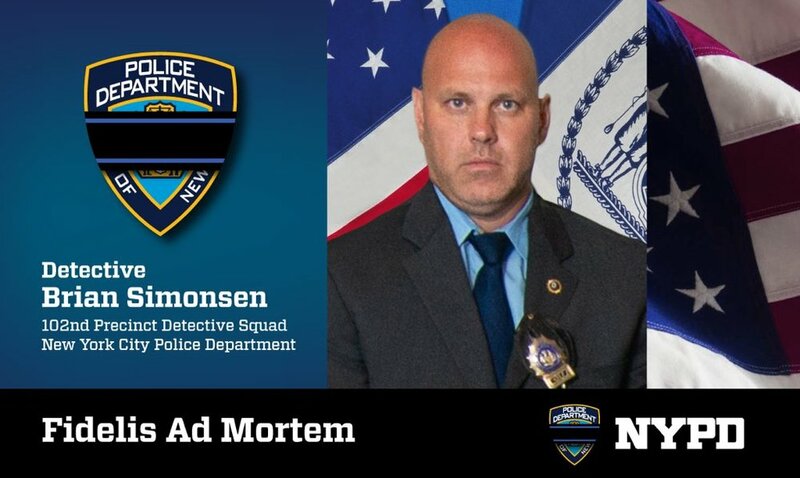 Detective Brian Simonsen, a 19-year veteran of the NYPD, was shot along with Sergeant Matthew Gorman after responding to report of an armed robbery inside a T-Mobile store located at 91-62 120th Street, O'Neill said. Simonsen and Gorman were shot by fellow officers when they exited the store. The suspect was still inside and carrying what turned out to be a fake gun. “Make no mistake about it — friendly fire aside — it is because of the actions of the suspect that Detective Simonsen is dead,” O’Neill said in a statement just after the shooting. The incident leading up to the shooting began just after 6 p.m., when 911 operators received two separate calls of a man with a firearm robbing the the T-Mobile store, police say. One of the callers reportedly stated that two employees had been forced to the back of store at gunpoint. Simonsen and Gorman, who were investigating a separate incident nearby, responded to the T-Mobile store as patrol units arrived. When the officers entered the store, they saw a man who fit the description of the suspect come out of the back, while pointing what appeared to be a handgun at them. Simonsen and Gorman fired at the suspect then retreated from the store, at which point Simonsen and Gorman were shot, O’Neill said. Simonsen, 42, was rushed to Jamaica Hospital, where he died. Gorman, who has been an NYPD officer for eight years, was shot once in the leg and taken by a passerby to Jamaica Hospital, where he is listed in stable condition. The 27-year-old suspect, who is from Brooklyn, was arrested after being shot multiple times. He was taken to Booth Memorial Hospital in Flushing, where he is listed in stable condition. In the wake of Simonsen’s death, an outpouring of support was heard from local elected officials. Councilmember I. Daneek Miller also mourned the detective’s death.